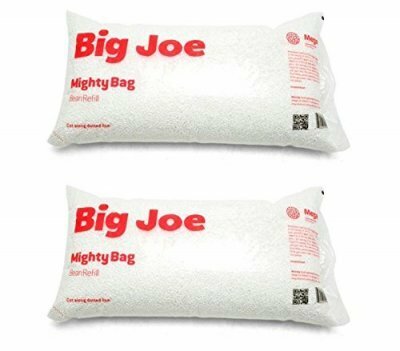 Big Joe is an American brand that manufactures bean bag refills and outdoor furniture in three facilities located in the USA. The Megahh bean refill is one of their flagships. These beans are made of 100% recyclable polystyrene and are slightly smaller than the average generic refill bean. The smaller size allows it to create a denser, more comfortable cushion for the bean bag. Each bean is round and puffy and holds on pretty well to everyday use. We spoke to a few customers who mentioned that the refills had far outlasted the stock beans that came with the bean bags. This is a twin pack, each one with 100 liters of refill beans. That’s approximately 3.5 cubic feet of beans per bag. In layman’s terms, that’s just about enough beans for an adult-sized bean bag. That’s unbeatable value for money! If you have never refilled a bean bag before, then ensure that you watch some YouTube tutorials that show you how to do it. You will have to create a funnel and load the beans into the bag to avoid static from wreaking havoc. There’s no filler tube or funnel included in the pack. If you are new to refilling bean bags, then it can get very messy with beans strewn all around the house. That’s a small niggle with an easy workaround though. 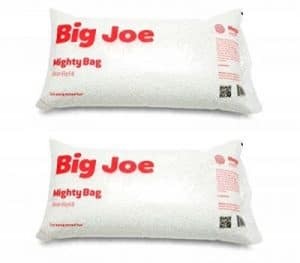 Big Joe Megahh bean bag refill is one of the best bean bag fillers in the market currently. The beans are consistent sized and will instantly make your flattened bean bag plump again.